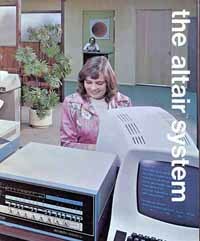 The MITS Altair microcomputer was the first personal computer available and sold in commercial quantities. MITS originally stood for Micro Instrumentation and Telemetry Systems but this name was almost never used after 1975. Later, MITS became a subsidiary of Pertec Computer Corp.
Sold as both kits and as assembled units, MITS called the computer system boxes "Main Frames" and featured both Intel 8080 and Motorola 6800 CPU powered units. In this section, I have reproduced in HTML format some of the MITS Altair general information and sales documents, brochures and some price lists. I have not attempted an exact duplication of the original documents but have used original images and text, with only a few editorial comments added, for the reader's information. A twelve page full color brochure dated just 1976, this slick publication emphasizes images over text descriptions. It features the Altair 8800b but includes a single page on the Altair 680b. I never owned an Altair. A partial reproduction of a MITS price list, including kits and assembled products.